There are different categories of Automotive Ethernet testing. Electrical signaling, which centers on an oscilloscope, is defined in the Physical Media Attachment (PMA) test group. These tests determine whether a product conforms to the electrical transmitter and receiver specifications spelled out in the BroadR-Reach or IEEE 802.3bw spec. Other tests focusing on the functionality of the protocol itself are found in the Physical Coding Sublayer (PCS) and PHY Control specifications. This is where you might send a command and verify that the device has responded properly. PCS transmit/receive, state diagrams, encoding/decoding, and scrambling/descrambling are some of the areas these tests touch on. The test specs also provide recommendations for other elements, such as the common-mode choke, EMC, and the communication channel itself. Let's now shift gears and discuss compliance testing in the context of Automotive Ethernet. The 100Base-T1 (IEEE 802.3bw) specification includes compliance requirements for the PMA, PCS, and PHY Control. But the IEEE's specification does not carry the test spec itself. Traditionally, the University of New Hampshire's InterOperability Laboratory, which hosted the first 100Base-T1 plugfest in November of 2016, has written test documents that describe how to perform compliance testing. Ultimately, it is up to the OEM, PHY vendor, or Tier 1 supplier to work with either a test equipment manufacturer or a test house to determine whether a product complies with the specification. Why is PHY compliance important? The main reason is that OEMs have lengthy development cycles for a vehicle's ECU. It is prudent, then, to assure that the PHY chip being designed around meets the specification's requirements before it is designed into the system. Once the PHY chip has been incorporated into the ECU, the system itself must also be tested for compliance. Testing the chip on an evaluation board is one thing, but testing it in situ is yet another. Is your ECU board layout correct? Maybe, or maybe not. Does the PHY chip's behavior change in the context of the ECU board? These are questions that you will want answered by testing the system for compliance. Remember that compliance with the 100Base-T1 specification is not a guarantee of interoperability. With PCI Express or USB, when your product passes compliance testing, it gets to sport the protocol's logo and you can expect interoperability with all other products that have likewise passed testing. However, while the 100Base-T1 specification provides well-defined transmitter requirements, the receiver implementation is left up to the designer. The test document written by the InterOperability Laboratory covers some test equipment requirements. 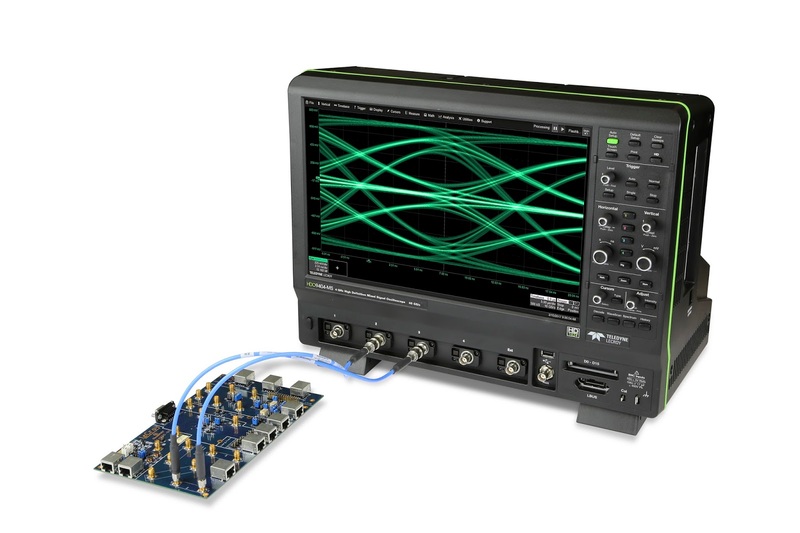 Automotive Ethernet's 100-Mb/s bandwidth calls for an oscilloscope with a bandwidth of at least 1 GHz with a sampling rate of at least 2 GS/s (Figure 1). Teledyne LeCroy recommends a sampling rate of 10 GS/s to ensure that you have 10X oversampling for jitter measurements. With the emergence of the 1000Base-T1 specification, the bandwidth requirement will move up to the 2.5-GHz range. Moreover, it's recommended that the oscilloscope used for testing have the ability to perform spectral analysis. Failing that, it's recommended to supplement the oscilloscope with a spectrum analyzer. For the transmitter distortion test, you need a sine-wave generator capable of a 5.4 Vpk-pk differential sine wave at a frequency of about 11.11 MHz. Along with that, you'll need two BNC cables and two BNC-to-SMA adapters to get those signals into the Ethernet test fixture. A short Automotive Ethernet cable converts whatever interface is on the DUT's MDI output to an RJ-45 connector. That in turn allows you to plug into the Ethernet test fixture. From there, the signal goes to the oscilloscope. A 1-GHz differential probe accesses the transmit clock, and you'll need a vector network analyzer for the return loss and common-mode tests. That sums up the test requirements. Next, we'll take a deeper dive into the subject of compliance testing for Automotive Ethernet.